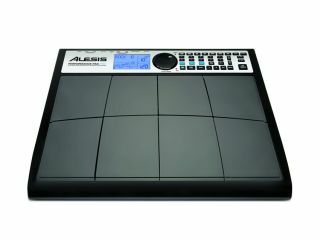 NAMM 2011 PRESS RELEASE: Alesis, a leading manufacturer of professional audio electronics and musical instruments, announces the PerformancePad Pro, a high-end version of the PerformancePad multi-pad percussion instrument. The PerformancePad Pro contains the sequencing engine from Alesis' best-selling drum machines. This three-part sequencer enables drummers and instrumentalists to program drum, percussion and accompaniment parts for creating complete tracks or playing along with loops. The PerformancePad Pro features a modern, high-definition sound set with acoustic and electronic drums, percussion, sound effects, bass and more. The PerformancePad Pro also contains powerful Alesis studio effects including Reverb, EQ and Compression for customising sounds to perfection. Drummers can also use the PerformancePad Pro as a MIDI controller for playing virtually any sound module, synth or software. Practising and performing musicians can connect and mix in a music source via the PerformancePad Pro's input. "The PerformancePad Pro builds on the successful PerformancePad," said Dan Radin, Product Manager, Alesis. "Drummers love the layout and feel of the original, and this new version adds a new, larger sound library and powerful new features."